Well, I kind of went nuts! 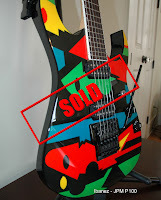 :) I decided to sell a bunch of stuff that I hadn't been playing much in order to invest in some good equipment that I'll enjoy more and some stuff that I can sell later when the market is back up (whenever that happens!). 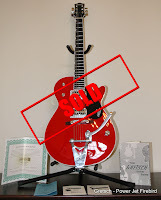 I decided to sell the Gretsch Power Jet, the Ibanez JPM P100, the Ibanez 20th RG, the Ibanez 7 string and my Peavey Wolfgang. These were tough to let go, but I really was not playing these guitars as often I as should have to justify keeping them in the collection. I got some pretty decent money for them on eBay, so it wasn't a total loss. 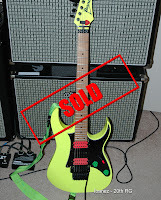 I also sold the PAF Pro (hot pink) pickups in the 20th RG separately (plus several more sets of pickups), some other miscellaneous stuff like a drum machine, some acoustic strings and a bunch of assorted audio and instrument cables. Two Rock 2x12 open-back cabinet fully loaded with TR 65-16 speakers. I scored this cab on the Gear Page for $400 which included speakers and shipping. This was an incredible deal and since it is slightly more worn than my other recently acquired TR 2x12 cab I shall use this one for gigs. It is a little larger than my first one (by one cubic inch) and I can really hear it in the low end. Great sounding cabinet!! 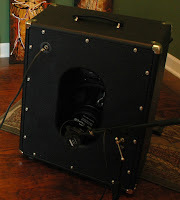 Two Rock 1x12 open-back cabinet, without speaker. I picked this little cab up to use at our rehearsal space with the band. I bought a used Eminence Red White & Blues speaker for it and I couldn't be happier! It is a perfect rehearsal solution and I also get to leave it at our space, so that is one less thing for me to carry. The overall sound is darker than my 2x12 Two Rock cabs, which I think is due mostly to the RW&Bs speaker. Sounds great, though! 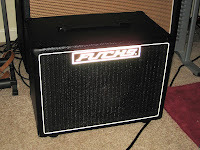 Fuchs Mini open-back 1x12 cab (w/Scumback H75-LHDC speaker). Now this was a incredible find for the price... I paid $350 for the cabinet with Scumback speaker and shipping. What a deal! This cabinet and speaker combo simply sound amazing. Due to the low load handling of the speaker (it is only a 60 watt) I must be careful what I hook it up to and how loud I play on it because it would very easily blow if pushed too hard. I plan to use the Mini mostly for recording and light gigs. This thing is tiny, and as such it will make a wonderful cabinet for low-volume gigs. Fuchs ODS 30 amp! This amp is absolutely awesome sounding. I still prefer my Kingsley, but I must say that the Fuchs ODS line is just stunning and if I weren't such a fan of my Kingsley ToneBaron I'd be a Fuchs player, no doubt about it. This is the Dumble tone at its best! Gorgeous note bloom on the OD channel and shimmery, sparkling cleans on the clean channel. Fantastic amp! Carol Ann OD 100 amp. I finally got one of the legendary Carol Ann amps that I have been curious about for so long. Unfortunately, this particular specimen doesn't have the gain voicing I like (high gain)... so it comes up a bit short on the OD side for me. 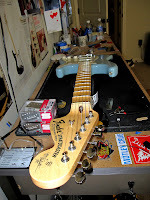 However, that can easily be fixed if I send her in to Alan at Carol Ann amps for a simple mod. I just might have to do that. I can report that the cleans are gorgeous and it takes a pedal really well. 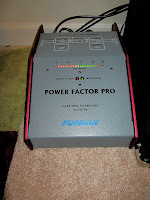 Furman Power Factor Pro Power Conditioner. I just stumbled across this thing while looking for deals on the Gear Page. 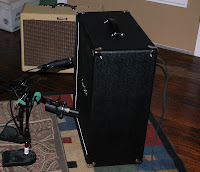 At first I was a bit skeptical as I began to read more about it, since Furman claims a noticeable tone improvement just by plugging your amp into it. The hype is real. I A/B tested it on my Kingsley with my wife in the room and even she heard the difference in tone between wall socket power alone and Furman conditioned power. This thing uses capacitors to ensure that your amp is getting a constant flow of the correct voltage of electricity, no matter how bad the current may be in a given room. It really does work! If your amp is starved for power it won't sound its best, and if you are drawing too much power damage can occur. Surge protection and protection from insufficient power... the perfect solution. If you have an expensive amp and gig it a lot, I would highly recommend one of these. Gibson Explorer Pro w/case. This was a nice grab for $900 total (with shipping). A practically unplayed Explorer Pro with case and a nice DiMarzio cliplock strap thrown in! It plays and sounds great. I love the cherry mahogany finish and the neck and board feel great. Assorted WCR handmade pickups. 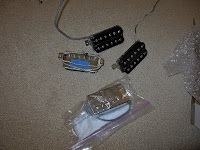 Last, but not least I grabbed a bunch of WCR pickups for a good price for my Les Pauls and other guitars. 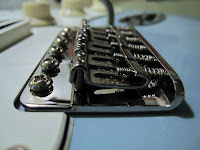 These are very popular boutique handwound pickups from California. Great stuff! 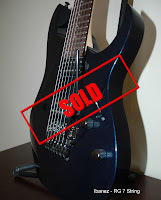 Well, that is it for the used gear sale/buying spree! It was fun and I got a bunch of nice stuff in return for selling mostly "so-so" decent stuff... I think I made out pretty good! I got in a Fractal Audio Axe-FX today and had a chance to play with it this afternoon. I am very impressed. This is easily the best sounding modeler I've ever encountered and certainly the best built, most powerful processing unit of its kind on the market. In terms of overall sound I have found I like the unit much better when used as a digital preamp running into a power amp that pushes a real guitar cabinet. Setup this way it is pretty much indistinguishable from a real amp. However, it does need a power amp to function this way... and a tube power amp to really get the feel I'm looking for. Great unit, well built and you get a new update to the software every two days. :) Great buy if your thing is tweaking and you like tons of paradigm-shifting updates on a regular basis. If you don't like MIDI then you'll probably want to stay away until the next generation comes out sporting some USB or Firewire connections... currently the only way to update the machine and run the optional footswitch is via old-school MIDI apps and hardware. I had the opportunity to accompany a friend of mine, Chris Arena, into the studios at Ardent and Audio Garden for a couple of weeks to help him record his album. Chris used several select pieces of gear from my collection on the record and it was a real pleasure for me to be a part of it. 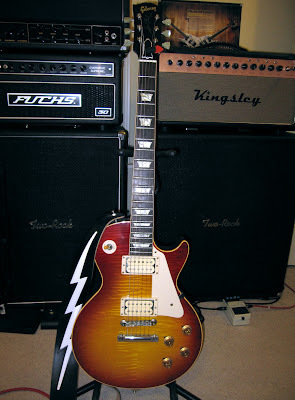 The main amp used for electric guitar parts on the album was my Kingsley ToneBaron head into my Two Rock 2x12 cabinet. 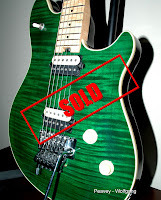 I also lent a few of my guitars to the production. 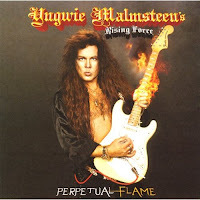 Some of the guitars used were my R9 Les Paul, Custom Shop 1960 Strat, Deluxe Tele and James Tyler Strat. The guys of Audio Garden, Mike Wilson and Jason Gillespie, are the very talented duo that coaxed some amazing tones from that gear (and the players, as well!). The real treat, however, was getting to visit Willie Mitchell's studio for horn parts. Willie Mitchell has arranged and recorded horn parts for lots of famous musicians such as Al Green and, more recently, John Mayer. It was a real treat to see a master like this at work. We all had a great time! Just picked up a great tuner pedal called the Korg PitchBlack. It is true bypass with a fantastic led indicator that is easy to read and see. There are multiple tuning patterns available including strobe. Great accuracy and very well built... and it's a cool black color! I have had great success with this pedal so far. Check it out if you get the chance! After acquiring the Two Rock 2x12 cabinet for my Kingsley ToneBaron and then fixing the intermittent radio reception the amp was picking up, there was only one thing left I wanted to "improve" upon: SAG. The ToneBaron has a beautiful tube sag feel to it which makes it perfectly suitable for blues and even some faster linear Jazz runs, but pulling off snappier, super fast “shred” licks is made more difficult because of this sag effect. 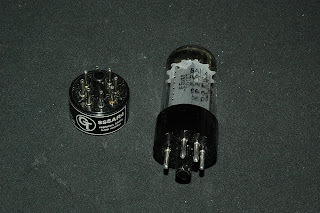 Since the ToneBaron is a tube rectified amplifier, it was easy to convert it over to solid state rectification using the Groove Tubes solid state rectifier plug in place of the 5AR4 rectifier tube that came in the amp. 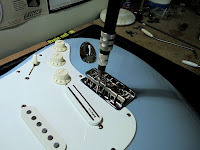 The SS plug lowers the sag effect significantly and increases the amp's response time to the signal coming from the guitar. What exactly is a rectifier and what does it do? Well the short answer is this: a rectifier converts the AC (Alternating Current) from the wall socket to DC (Direct Current) which electronic circuits need in order to operate correctly. Batteries also provide DC current, by the way, and is what the typical guitar pedal, handheld gadget and/or children's toy uses for power as well. 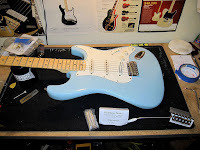 So, when a tube rectifier is used in an amp as the sole converter of AC power to DC power there can be small current drops to the amp's internal circuits when the amp is taxed by digging in more on the guitar or by playing the amplifier loud. The rectifier tube works harder to keep up with the increased voltage demand by the amp which lowers impedance causing a natural compression in the sound (this compression effect is referred to as “sag”). This compression, or sag effect, can also make the amp feel more sluggish to the player and, therefore, make faster licks more difficult to pull off. It feels kind of like attempting to run in deep, soft sand. A solid state rectifier, on the other hand, is built with semiconductors and has a lighting fast response which introduces little to no sag when the amp requires more power. 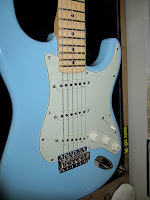 This, as you might expect, produces a "quicker" feel when playing faster licks and riffs. There is no right or wrong answer when it comes to tube sag. Whether or not more or less of it is desirable is totally up to the individual player and his or her style. I personally like some tube sag in my sound and the Kingsley ToneBaron still has plenty of it despite my replacing the tube rectifier with a solid state plug. 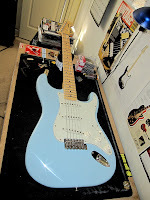 By using the solid state rectifier plug the amp’s response to input has increased significantly and I am able to play faster licks now while retaining the tone I like from the amp and getting the response I need in order to play my style. Ever since I started playing tube amps I have noticed a problem with radio reception here in Memphis with different, random equipment. Not sure what the cause is, but it certainly seems to have something to do with this location because plenty of other locals I've talked to have had similar issues. It doesn't happen with every single amp or pedal, but there is no denying that the potential for radio reception in audio equipment is definitely high in Memphis, TN. Behold, the "RF mod"! 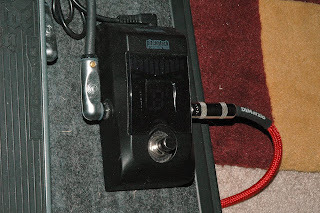 I had to do something to get that twangy country stuff out of my amp! :) I am a rocker, after all, and I can't chicken-pick so there was no use trying to play along. I got this mod off the Gear P age message board from a post made by Randall Aiken of Aiken amps, a great line of amps in the Marshall vein. 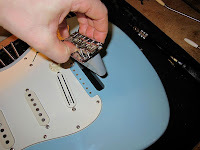 He suggests trying this mod if your amp is receiving radio signals only when the guitar cord is plugged in. This usually means your cord is acting as an antenna and that it is less likely that something more internal in the amp is the cause. If you're going to suffer from RF problems, this is the best variant to have because it is totally reversible and very easy to fix. 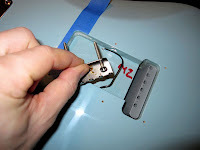 All you have to do is open up the amp, solder one lead of a .01 mF capacitor to the ground (sleeve) lug or the tip lug of your input jack and the other lead to the chassis of the amp. Problem eliminated. And I mean completely eliminated as in zero radio signal heard at any volume. Basically what is happening is the amp is still picking up the radio station, but before it can pass through the cable jack and into the signal path, the capacitor "grabs" the transmission and sends it off to the chassis where it can cause no harm. Pretty cool. Best of all, the mod costs only a few dollars and you can easily find these caps at your local Radio Shack or similar electronics store. 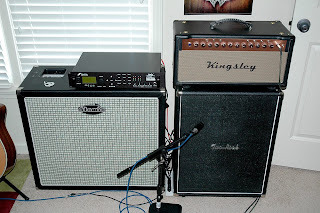 I love my Kingsley ToneBaron amp, no doubt about it. However, I was having some doubts as to whether the tone I was getting out of it was really something I liked. 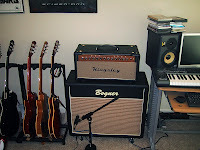 Since, at the time I took possession of the amp, my only cabinet was my Bogner Over-Sized closed-back 2x12, I had only experienced the ToneBaron through that cab. Big mistake. The ToneBaron seems to require an open-back cabinet in order to sound the way it was intended (after all, Kingsley amps are built and tuned with open-back cabs). This is an older model open-back Two Rock vertical 2x12 cabinet, with two (Eminence made) "K&M 65-16" 12 inch speakers at 16 Ohms running in parallel for a total load of 8 Ohms. These particular speakers are said to basically be the same as the Eminence "Red White & Blues" speaker model. They have a fat, round sound with notched upper mids to keep fizz and harshness to a minimum. This is a great sounding cabinet. My Kingsley instantly lost all the fizziness and artifacting that was present on the Bogner cabinet, and the notes got fatter, juicer and more sustainful. 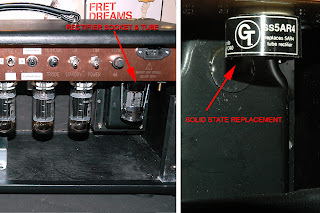 The problem with a closed-back cabinet like the Bogner is that the notes are "choked off" by the sealed back design... they never have the chance to sustain and decay. On an open-back cabinet like the Two Rock you get a much more three-dimensional, widely dispersed and less directional tone with notes that ring out and sustain due to the speaker cone being able to vibrate to its full potential. The quick response and low-end of the Bogner 2x12 is great for fast, chunking metal rhythms but not so much for liquidy, searing leads on a Les Paul. The Bogner sounds great, but I think it will sound even better as an open-back cab. I have a spare back panel for this cabinet that I plan to cut to convert it to an open-back cab. Can't wait to hear it this way! So I finally got to hear my ToneBaron on a cabinet that is much closer to what the builder originally designed the amp around. I have decided to purchase this cabinet from Doug, and I am happy I found it. My Boogie sounds great on it, too! And it is much easier to carry around due to its smaller size and low weight. This was an excellent find and a good purchase.